Wedding photojournalism. Editorial fashion look. Candid. Spontaneous. Not posed. Photojournalistic. Call it what you want. It is what today’s bride is all about. You don’t want your wedding pictures to look like your parent’s wedding album. You want something casual...something unique...something that tells the story of your wedding day. I have garnered numerous awards on the local, state, national and international level. I’m not going to brag about them here. You can find those accolades elsewhere on this web site. The reason I bring that up, though, is because one of the key elements of an award-winning image is it’s ability to tell a story. This is one of those images. If this image were to be entered in a professional photography competition I would title it "Fashionably Late" -or- "Late For The Ceremony" -or- something along those lines. Because that is the story behind this image. We see the bride here, rushing up the steps to her wedding ceremony, slightly late, but knowing that her groom is inside waiting for the reveal...waiting to see his bride for the first time as she walks up the aisle to give herself to him in marriage. They say a picture says a thousand words. This one speaks volumes.This image was captured on the steps of the former LaSalle Military Academy located on the new Campus of Saint John’s University in Sayville, New York. Also located on those grounds is The Bourne Mansion where this bride held her wedding reception. The stately old mansion with it’s beautiful classic architecture is not only an elegant venue for a wedding reception, but is also a wedding photographer’s paradise. Stunning photo opportunities are everywhere from the intimate bridal suite to the magnificent Grand Ballroom. Outside there are sprawling lawns leading to the waterfront of the Great South Bay and a tree-lined drive leading to the grand entry to the mansion. 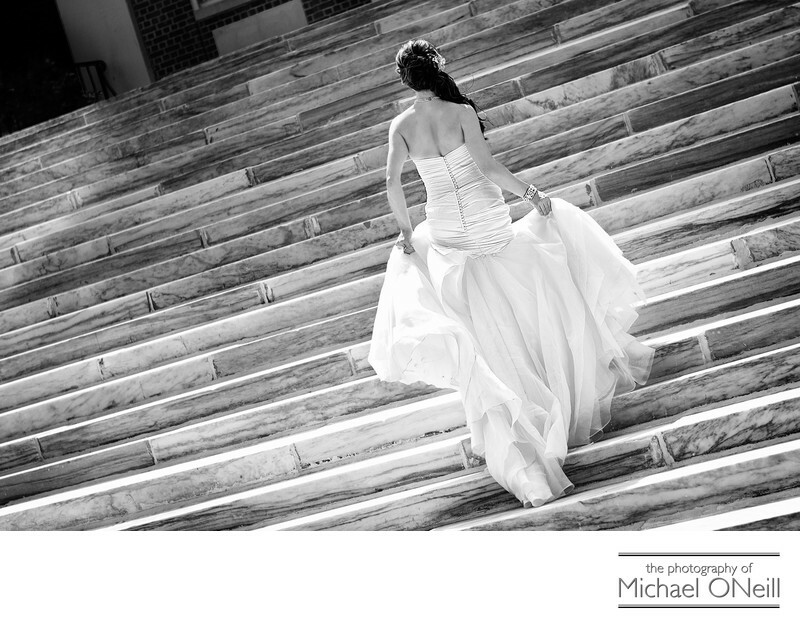 I love creating spectacular wedding photographs at the Bourne Mansion and would love to be part of your big day there.